My husband brought home a jar of homemade salsa that was given to him by a coworker. It was delicious! I have tried several Salsa recipes over the years and this one topped the list. They said that the recipe is a baseline recipe and they tweak it every time it is made. So here it is, experiment away and consider this just a foundation to the salsa goodness. Sanitize and warm jars. Warm salsa to about 180 degrees for a hot pack. Fill jars and leave about 1/2" head room. Seal and water bath for 30 minutes at 1000 feet. Enjoy! If you make tweaks to it please feel free to share. It has been a long time since I posted. I need to get back with it. Over the past several months, I can't even count how many times, I took pictures and thought of things to write about. Life and my busy hours got in the way. 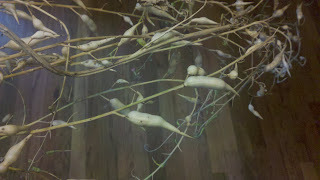 Last year I wrote about the heirloom radish varieties that I purchased from Seed Savers. In the post I mentioned that I would let one variety go to seed each year to prevent them from cross pollinating. This year I chose the Philadelphia White Box. 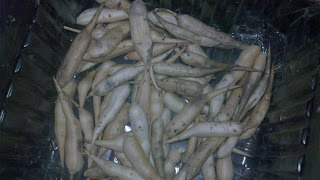 Saving radish seeds is quite easy, just tedious and repetitive. Although a great thing to do while watching your favorite program on TV and is easy enough a 4 year old can help. Radishes that go to seed will flower then develop a pod in place of the flowers. I allowed the pods to become completely dry before I harvested them. The easiest way I found to remove the pods is to slide my hand down the tiny branches collecting the pods in my hand as I go. 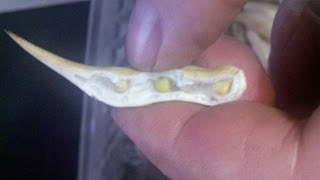 After I collected the pods, I simply broken them open to reveal the seeds. The average seed per pod was 3. Sometimes the larger pods would hold 5 or 6 so my suggestion would be go for the larger pods first then the smaller if you are still needing more. Store the seeds in a cool, dry place for up to 5 years. Honestly it is a lot of work for a couple seeds. But like I said, it is easy enough to do while watching TV and you can always have your kids/niece/nephew/paper boy do the work.